MEATBALLS ARE COOKED IN A COVERED SKILLET. YOU DON’T HAVE TO USE THE OVEN AND HEAT UP THE KITCHEN! Here’s a good recipe for meatballs. I adapted it because I didn’t have Italian seasoned bread crumbs, and we really liked the way they turned out. This recipe makes 12-14 meatballs and feeds 3-5 people, depending on how many meatballs each person eats. Mix well. Form 12-14 large meatballs. Preheat large skillet on medium with a little olive oil, place meatballs in skillet and cook COVERED for 12-15 minutes, turn and cook 5 more minutes. Serve over pasta with sauce along with garlic bread and salad. 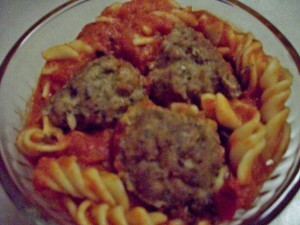 This entry was posted in Recipes &Cooking and tagged skillet meatballs, turkey meatballs made from scratch by Charla. Bookmark the permalink. These sound so good. I love meatballs.